Ghee, a staple in Indian cooking, is popular for its high-smoke point and nutty, toasted flavor. The best and purest ghee is the one that is homemade from grass-fed, organic, unsalted butter. Ghee is unsalted butter than has been cooked. The cooking process melts the butter, which separates the milk solids from the yellow liquid. Sometimes also known as clarified butter, ghee is actually clarified butter that has been simmered down longer to the point where the milk solids cook a bit, giving the butter a nutty brown hue, and a roasted flavor. Ghee has a much higher smoke point that regular butter, and it has a longer shelf life. It can be stored at room temperature or can be refrigerated for extended shelf life. Ghee has high smoke point which makes it ideal for sautéing and frying. Ghee can be used to most recipes that call for butter or oil. 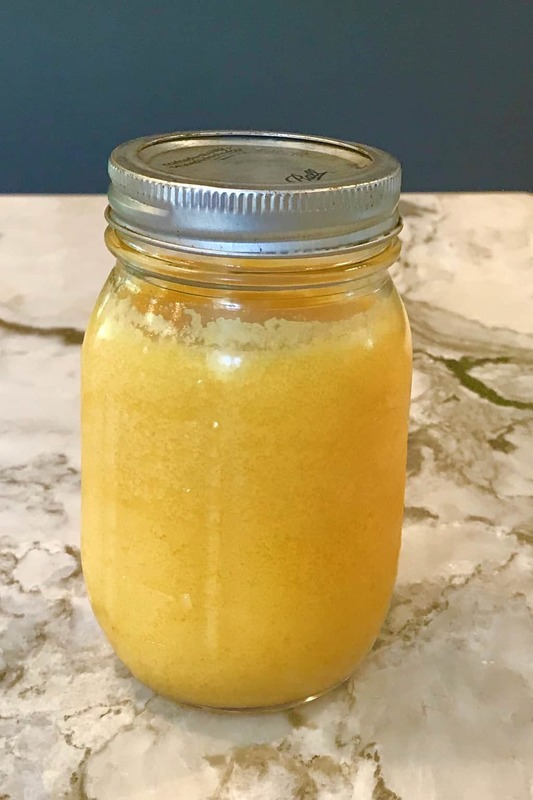 Although, ghee is sold in many stores, it is very easy to make it at home and once you have tried this homemade version, you will not go back to the store bought. The aroma and flavor of the ghee made using unsalted Irish kerry gold butter is simply divine and always takes me back to my mom’s kitchen in India. I have been making stove top version of ghee for 15+ years. 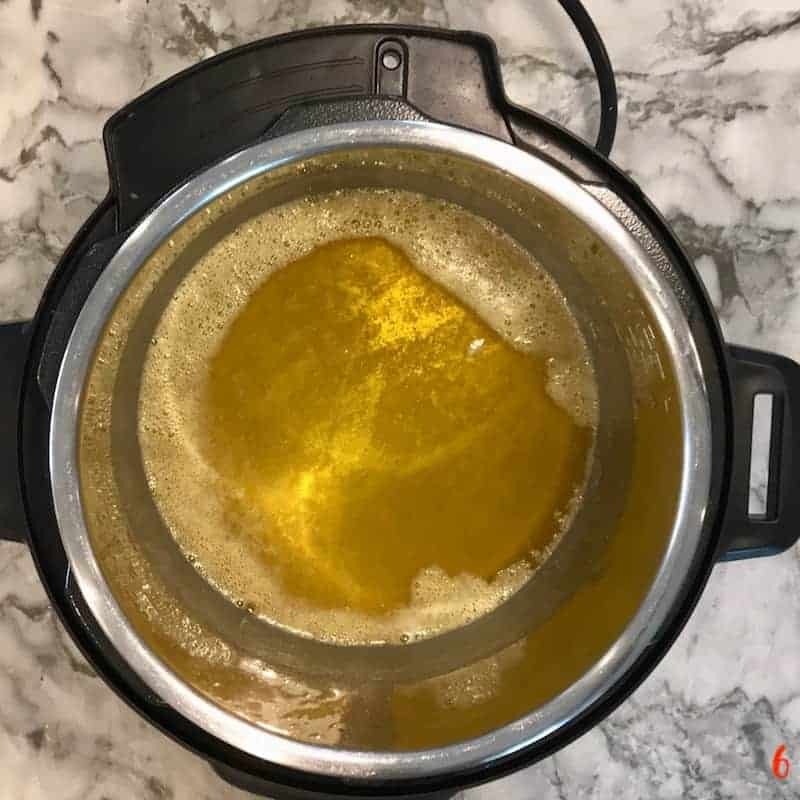 Last few years, I have started making ghee in my Instant Pot using the Saute(normal) option. Although stove-top version works well, I was never able to tell the exact time and temperature at which ghee will be perfectly cooked. Depending on the temperature of the butter, total time to make ghee could take 9 to 11 minutes. Here in the photos below, it shows the process every 2 to 3 minutes and the different stages the butter goes through. Turn the Instant Pot off when you see all that white, milky froth disappear. 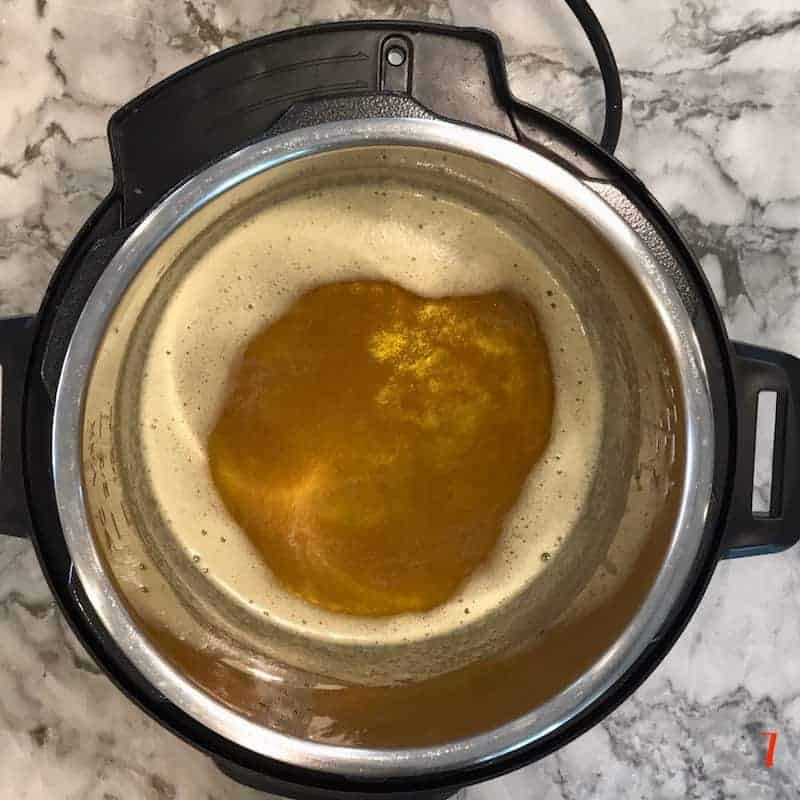 The Ghee will continue to cook for next 2 to 3 minutes as the Instant Pot gradually cools down. 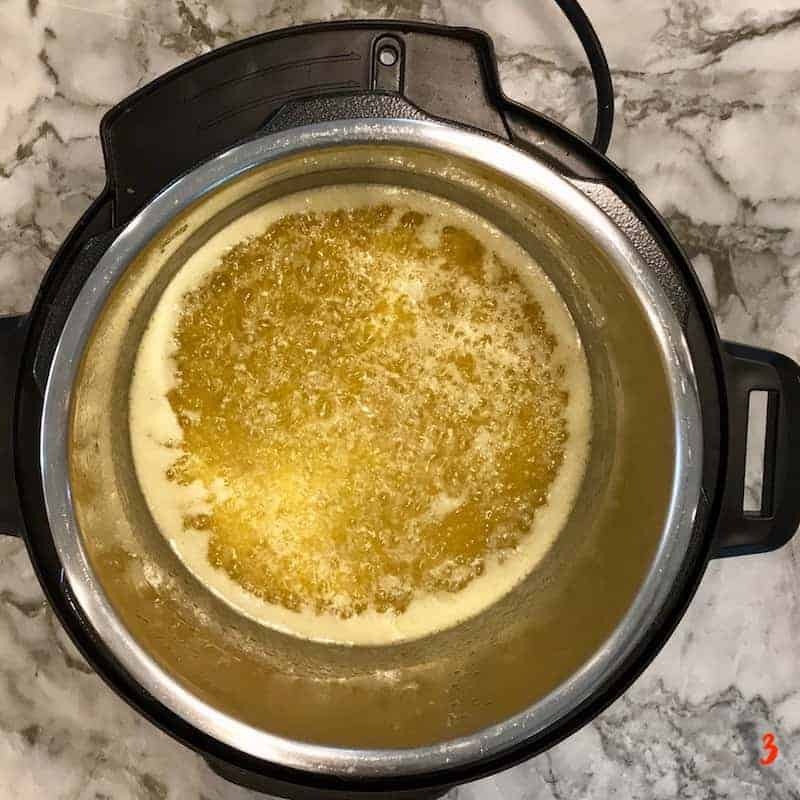 Note: If your ghee already looks like step 8 below, take the inner pot out and place on a hot plate to cool down so it does not cook further. Allow the ghee to cool down completely before straining it. 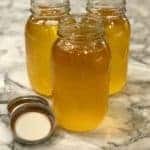 There are few recipes out there with slow cooker version of ghee in Instant Pot and I am sure they all work great. I usually do not have time or patience to spend 2-3 hours in slow cooking mode. So here is a quick 10-minute method that makes perfect ghee with 16 oz of unsalted butter. 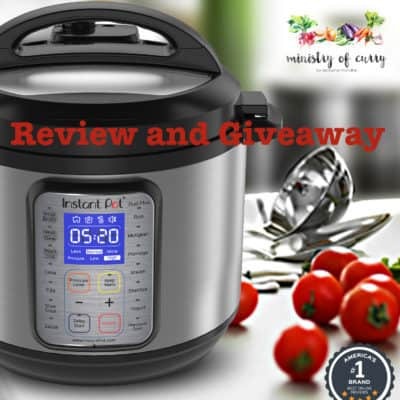 If you are doubling the recipe you will need 15 mins of cook time in the Instant Pot. Set the Instant Pot to Saute (NORMAL). To change the settings on Sauté mode either press the adjust button or press Sauté button multiple times to switch between less, normal and more modes. Add the butter to the Instant Pot. Butter will start to melt, then turn milky & frothy. 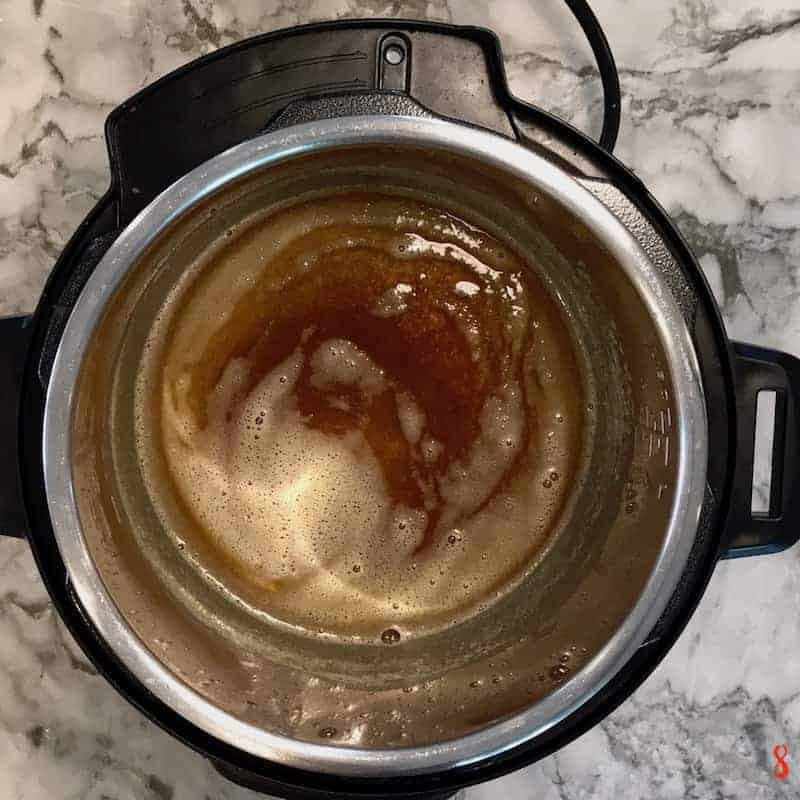 After about 8 to 9 minutes, depending on the temperature of the butter when you first added to the instant pot, the froth will start to disappear. You will see transparent bubbles being formed and should be able to see the bottom of the pot. Turn the Instant Pot off at this point. 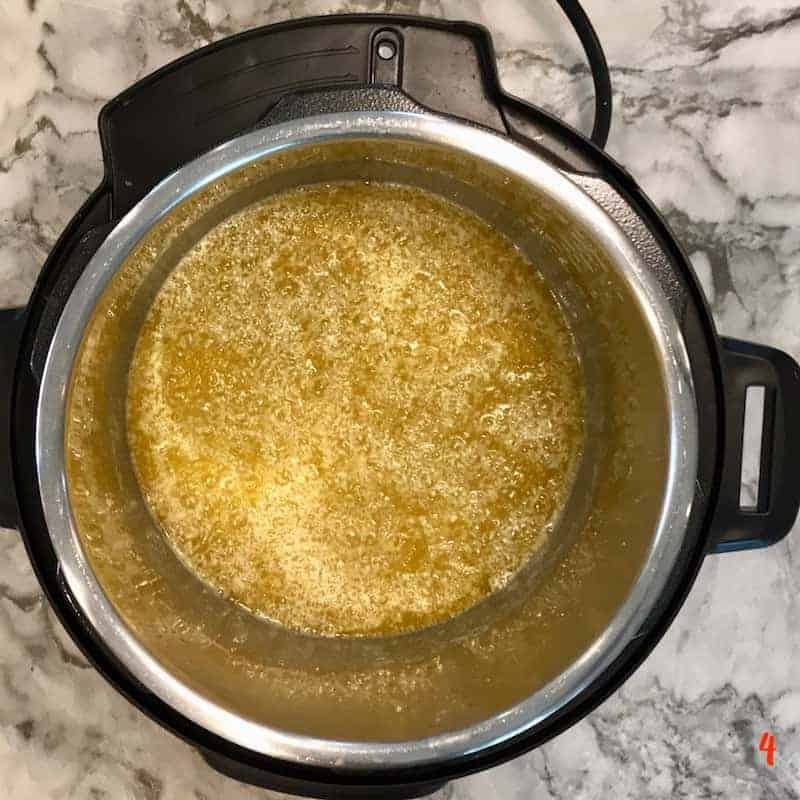 The Ghee will continue to cook for next 2 to 3 minutes as the Instant Pot gradually cools down. Note: If the bottom of the pot looks brownish, take the inner pot out and place on a hot plate to cool down so it does not cook further. 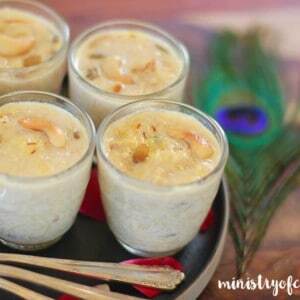 Allow the ghee to cool down completely. Then strain the ghee using a strainer or cheese cloth into a clean and dry glass jar. Stored at room temperature or can be refrigerated for extended shelf life. Note: If the bottom of the pot looks brownish, take the inner pot out and place on a hot plate to cool down so it does not cook further. 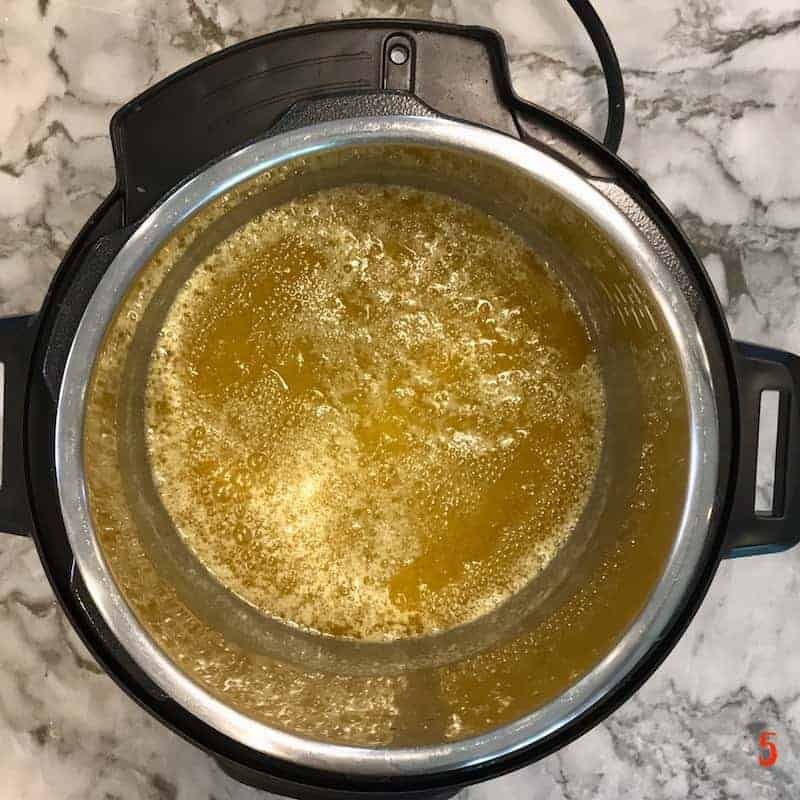 Here is a link to my stove top version of homemade ghee. I use ghee in most of my cooking and baking. I think mine overcooked…should it be this dark? I am not sure how dark it is but when it cools down it usually lightens. And little extra browned ghee smells and tastes amazing! Would lining a sieve with a paper coffee filter be sufficient? Or should I go purchase one of the reusable coffee mesh sieves? Thank you for this recipe, by the way. Looking forward to making it tonight!! paper coffee filter would work perfectly! Let me know how it comes out. Thank you so much, Archana, for your prompt response! I definitely will let you know! Tried with a coffee filter. The color it still brown, but it still tastes great. Thanks! Happy to hear it tastes good Smita. Next time you can take the IP insert out as soon as the timer is done which stops further browning or reduce the cook time by a minute or two. I made this tonight and used store brand unsalted butter. Mine looks more like a light creamy brown then yellow like yours…is it still good? Gerry, Did you cook in Instant Pot or Stove top? When the cooking finishes you should almost be able to see thru the bottom. Once it cools down it does start to thicken up depending on the temperature in the area where you store it. Either ways I am pretty sure it will be good. I have read elsewhere that you can use salted butter. What are your thoughts?! Hi Rebecca, I have used salted butter in a pinch. Just reduce the cooking time by a couple of mins. You will still get perfectly tasting ghee. How can I adjust the time if I only have 8 oz of butter? Hi Neha, I would cook it for 5-7 mins. Watch when all the white granules start to disappear and then turn off the IP. I tried with 8 oz of kerry gold unsalted butter and my ghee had white froth on top of it and it was brown in color and looks like burnt and still undone. Did you adjust saute to normal? Hi Shilpa! How did it looks after cooking down? Usually straining will remove any browned bits from the bottom. I have the question too! What’s the setting that we are supposed to use instead? 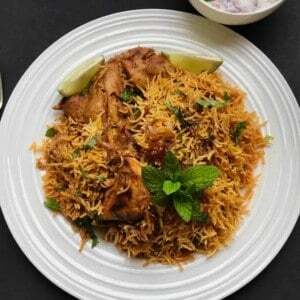 Hi Bhawna, Saute(Normal) with a 5-7 minute external timer. Ghee will continue to cook after you have turned the IP off. worked perfectly!! Thank you? Very hard to believe that ghee can be made in just 9 minutes but it did! 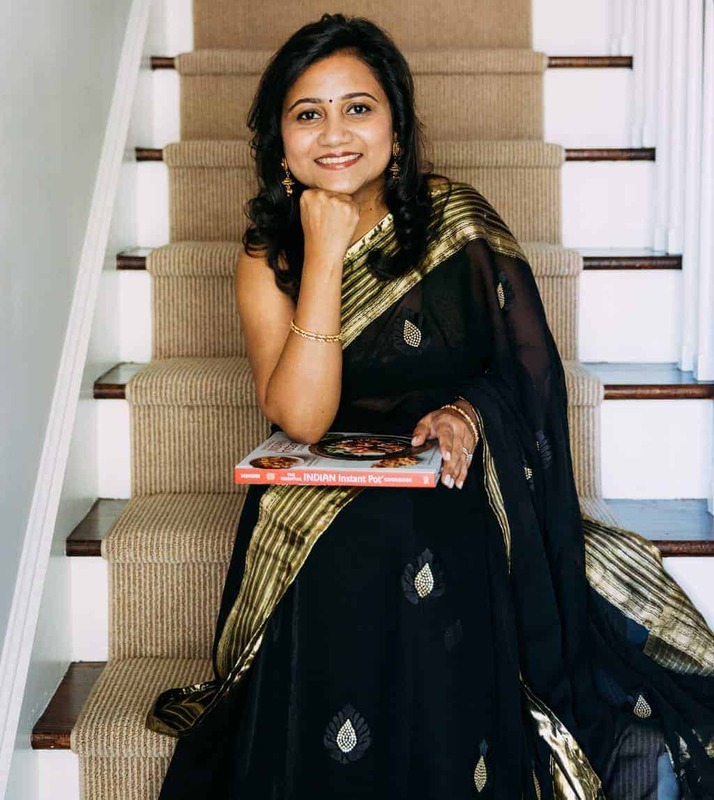 Hi Supriya! So glad you made ghee in IP! I no longer make mine on stovetop. This is such a foolproof recipe. Thank you for this post. 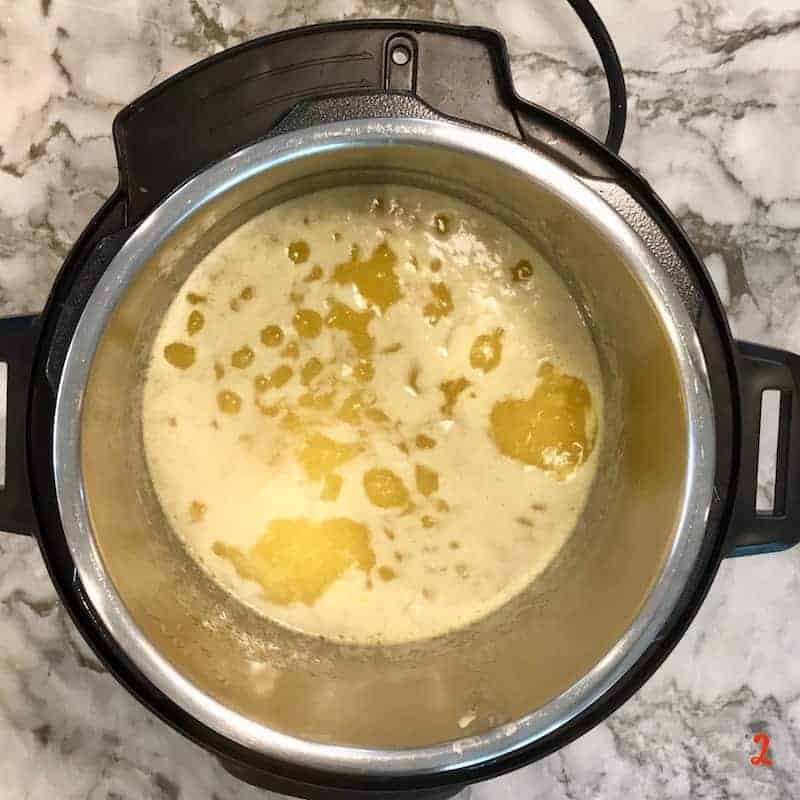 After several failed attempts on stovetop finally i got the ghee i always wanted to prepare.i am a busy mom so it is hard tp babysit the ghee but this one was awesome, 10 minutes only job. Never buying ghee from store when its so easy to make with clean ingredients amd cheaper too. Thanks again!! Hi Neetu! So glad this worked for you. I have burnt my ghee many times and once I figured out the time and temps for IP, its been perfect every time. Clean up is pretty easy too! thank you for your recipes. I have shared your blog with my friends too who are new to the world of IP. I eagerly wait for your vegetarian recipes cooked in IP. Thank you Neetu! I appreciate your kind words. 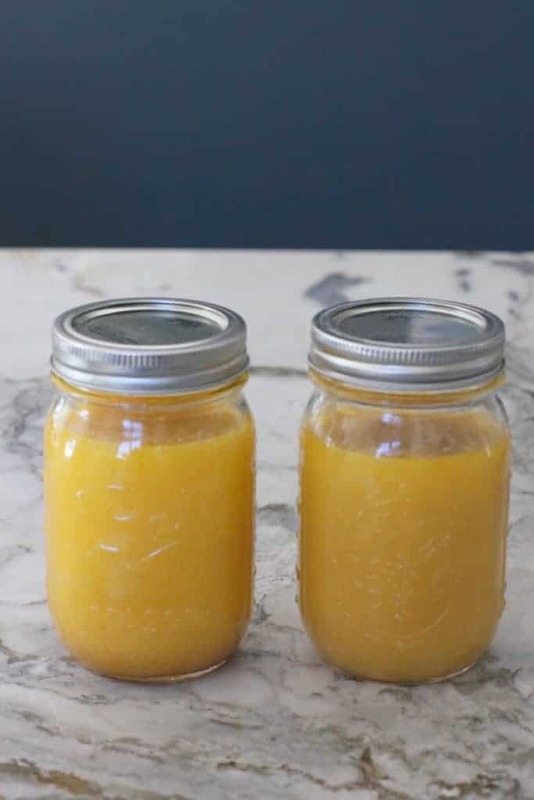 wow , looks easy to make ghee using IP will definitely try it.Thanks for the great share! Thank you! This is the only way I make my ghee now. Hello! May I know what is the advantage of doing it in IP? I am curious because I have always done it on stove top for years and it has come out well. Just trying to understand the differences and advantages. Hi, Using IP is just another way of cooking ghee. If you know the exact stove-top timing and temperature and can make it consistently then you can continue making it on the stove top. 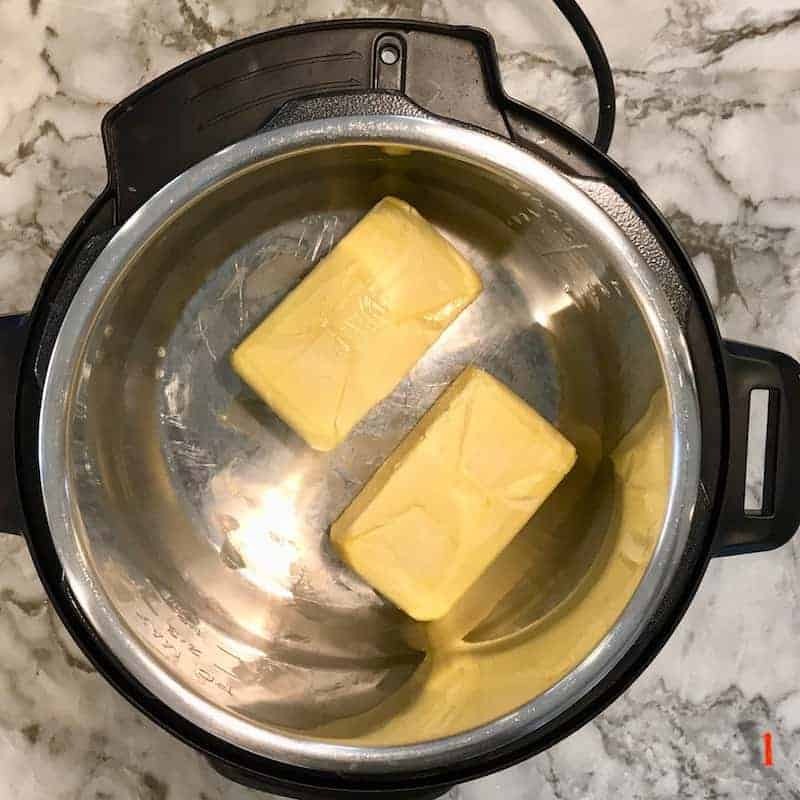 With Instant Pot I know the ghee will be ready in exactly 15 mins for 16 oz of butter I use. I have burnt a couple of batches on the stove top as I forgot about it. So with IP since I always start the timer as soon as I press the sauté button. Also I know setting it to normal does not need me to intervene the process. 4 pounds will def work in IP. I usually make make 2 pounds at a time and it takes 15 mins. For 4 pounds try setting it to 17-18 mins. You can always add more time if needed. Hope this helps. How Long can it be stored at room temperature? And what’s the shelf life if refrigerated? Hi Archana, if I were to double quantity of butter, would I also have to double the time? Or keep it the same? or just go up by a few minutes? Thank you for this – made my life so much easier! Hi Nandini, I use 16 oz of butter most often times. The cooking time is 15 mins. Hope this helps. Followed your directions exactly, but mine is brown after straining rather than yellow like yours. Did I burn it by letting it cool too long? Should I have strained it right away? Is it still okay to use? Hi Sarah, Does it smell good to you? If it does it will be good. Once it completely cools down it will be yellow. Either ways it will be okay to use. I made ghee once and this looks easier! Thank Anna! homemade ghee is the best!! Hi Archana, first time IP user and i decided to start off with your ghee ;> Fingers crossed . Anyway my 15 minutes are up but there s still white solids in there. Are they supposed to brown ? Hi Smitha! So after you turn off your IP in 15 mins it still continues to cook for another 2-3 mins and that is when it will brown. Came out perfect.This is wonderful !!!!! Archana, Does the butter need to be in room temperature or straight from fridge is ok ? Very nice! Thank you for the recipe. Mine does not have a normal feature. Do you have any suggestions? Conclusion: When Archana refers to “Normal”, this means “Medium” on the IP Ultra. What does using an Instant Pot add to this? Couldn’t the same thing be done in a saucepan? Not sure I understand the need for the Instant Pot. Instant Pot adds the consistent timing, which I could not get on stove top. And yes, my blog also has the stove top recipe if you would like to try. I made 32 oz with 15 mins timer, I was watching it carefully but last min kids distracted and I felt it burnt, I removed insert from pot, and when I strained it the left over solids were brown and the strained ghee smells like caramel.. do you think it is still good ? And can I store it at room temperature? 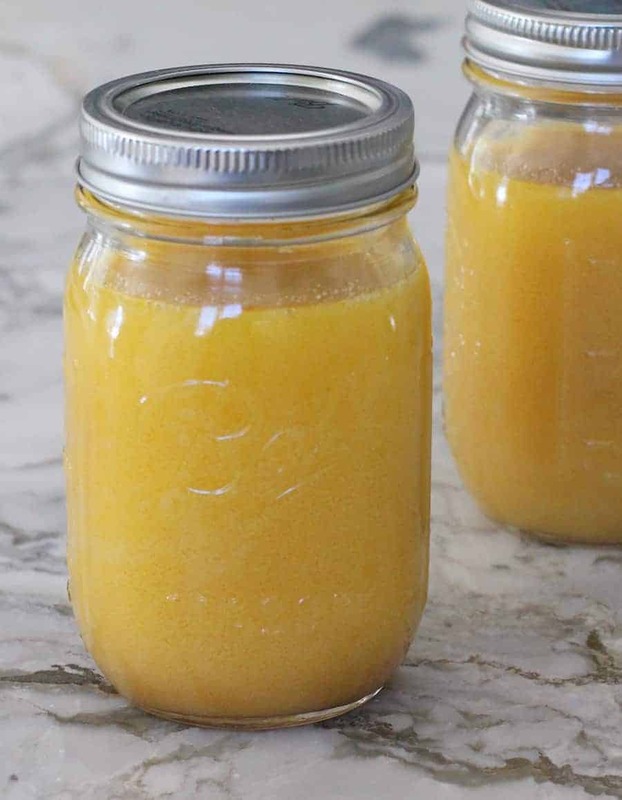 Do you sterilize your glass jars before storing your ghee in them? You can, but it does not go bad. I always have it at room temperature. Thanks for the recipe Archana! This is the quickest ever I have made ghee! 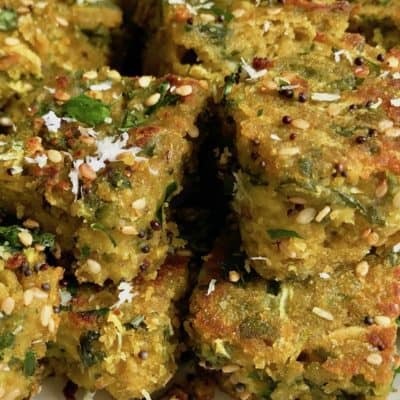 A little tip( from a grandma) for beginners – add 2 curry leaves towards the end and when they turn crunchy and are crackling, then that’s the point that the ghee is done and you can transfer it (to avoid over browning). Hi Sharan! Thank you for the lovely feedback. And I agree curry leaves give a great flavor just make sure they do not have water and are completely dry before adding to the ghee. Perfect! I made the 8oz Kerry butter for 5 mins sure, then 1 min off. I was stirring the entire time. 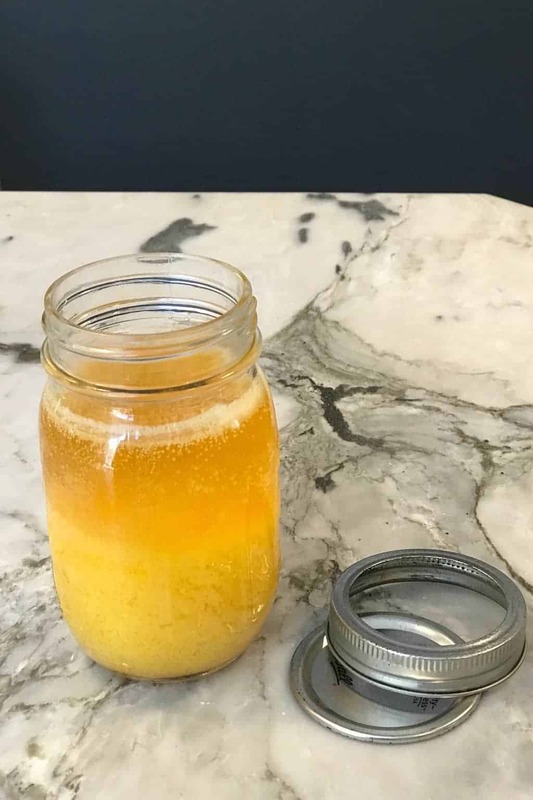 Ghee looks golden. Do you start with cold butter from the fridge or room temperature butter (or does it matter)? I start with cold butter. Cooking time will be little less for room temperature butter. I made the ghee this afternoon but it’s still liquidy. How long does it take to thicken? How do you store yours and for how long will it last? Does it go bad after awhile? I remember my grandmother having homemade ghee at home, but I don’t remember how long it would stay good? Is that brand of butter ( irish kerrygold ) easily available in USA store? After 9 mins..i switched off my IP.. my butter sticks are still small sticks..would they cook with the remaining heat? 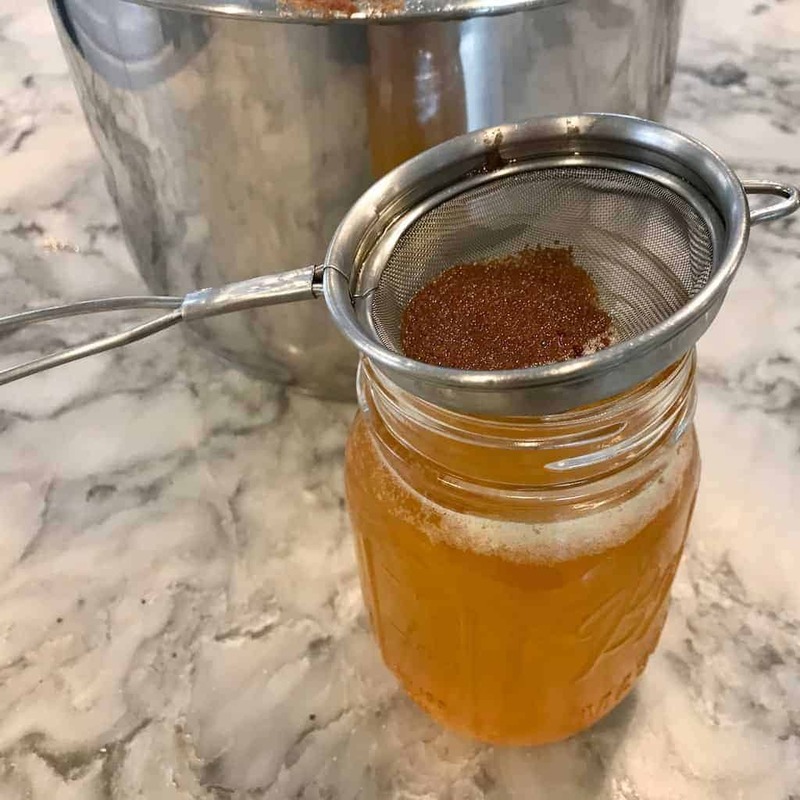 I am so excited that I made ghee and it was so easy. Thanks for this wonderful (and time saving!) recipe. My ghee is just cooking in the mason jar and I thought I saw a few solids in the bottom of the jar. Is this normal or am I being paranoid? Lol. I did use a fine mesh strainer. So just to be sure, I strained it again into another mason jar. Hi Pam! I am SO happy for you. And yes, have little brown bits at the bottom of the jar is totally ok and expected. HI Archana, I followed the same method and used kirklands unsalted butter. But I did not see black residue at the bottom instead it was white sticky residue left at the bottom. I poured ghee in the bottle. Do I have to boil it again? My instapot doesn’t have a normal setting in sauté. But you can customize one. What would normal be on a degeee setting? Hi Judi, Please tell me which model do you have? Hi! By default the setting is Normal, so you should be good. You can also try pressing the adjust button to see if the display changes. Do not have any brown bits at the bottom. Does that mean I need to cook it longer? Yes, there should be a little bit of browning at the bottom. I made ghee. 32 oz. It took 15 minutes. Came out good. Slow cook is too slow for me. You are welcome Harsha! I agree, I am not going back to stove-top method. 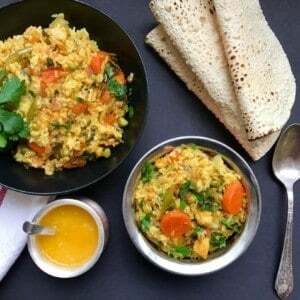 Hi There, thank you so much for sharing this method of preparing ghee. I used double the quantity of butter for mine (unsalted and refrigerated). At 15 mins mark there were still some milk solids floating up top so I let it go couple more minutes but then the whole mixture turned all bubbly and rise almost to the top of the insert:( I turned my IP off and now it’s settled but dark in color. Is it safe to consume it, did I burn it ? Hi Laika, So the ghee continues to cook even after you turn off the Instant Pot. I am pretty sure its is safe to consume, infant it will be even more aromatic and nuttier. Just filter the brown solids and allow it to cool. Once cooled it will solidify and will be much lighter in color. Tried making this today and about 5 minutes in, the pot started splashing hot butter everywhere. I promptly turned it off and unplugged it. Any thoughts on what went wrong? I double checked and it was on Saute and the normal setting… I have the IP Smart. 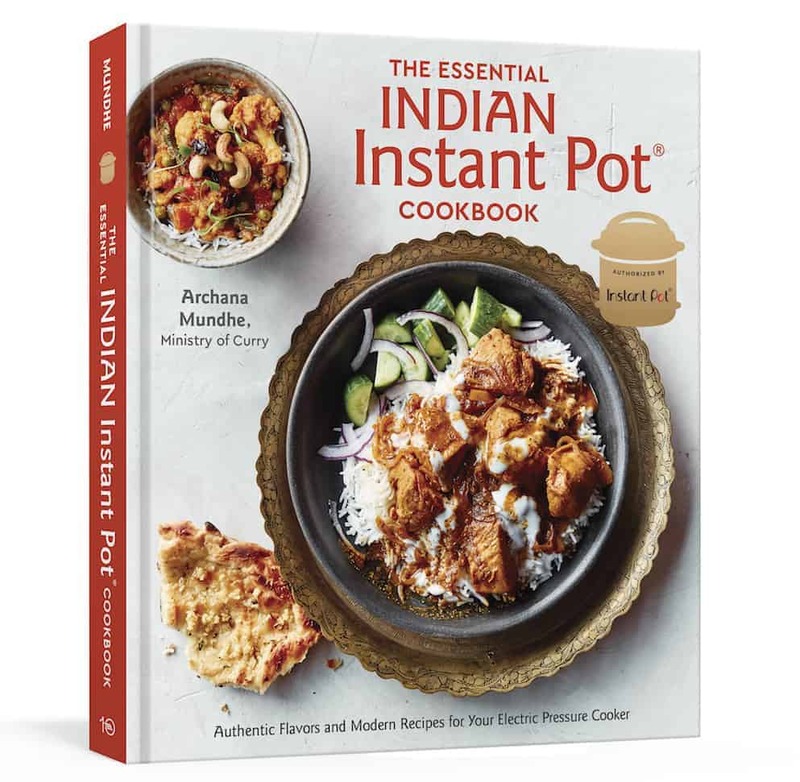 Hi Monica, Was the Instant Pot completely dry? Any moisture/water content can cause the butter to splatter as you heat it. You can keep a glass lid on it as it continues to cook. If there is already water content in the pot there is nothing you can do. the only way is to allow it to evaporate which means it will splatter. This also happens with stove top cooking. Also sometimes the butter if kept at room temps can have condensation around it which causes it to splatter when heated. I hope you are able to salvage the ghee. Please keep me posted. Thanks so much! It was dry but the butter had been out for a bit so the condensation could be the culprit. I read your notes about making it straight from the fridge after it had already been out some. Unfortunately I ended up tossing the result since it never fully solidified and since my daughter is allergic to dairy, I was worried there may still be milk solids that caused it. Thanks so much again for the response and I’ll try again without letting the butter cool at all. Yes condensation on the butter could be the reason. Also ghee sometime does not solidify at room temperature. You can keep it in the fridge for that. As long as you have browned bits at the bottom of the pot after cooking the butter you are good to strain and use the ghee. Thanks for this. Such a breeze in IP compared to stovetop. Thank you Ami! I am so glad you liked this method of making ghee. Love your book!! Wanted to give back to you, so here’s an even quicker and easier way which doesn’t require any stirring or babysitting whatsoever. Put 1-2 pounds of Kerrygold unsalted in IP. 14 minutes, venting (not sealing), steam (+more). Ignore any burn warning (but I never get this with this recipe, my friend with IP lux got it but did fine ignoring it). Immediately do QR once the IP beeps and 14 minutes is over — all the milk solids will be roasted and be at the top. Filter it immediately and get a nice light golden ghee. Hi, Thankyou for this recipe. I do not have an instant pot but I do have a very large croc pot. Will this work for me? If so how long will it take? I have 16oz kerigold unsalted butter too. Love this simple, thorough explanation with the pictures. Well done. 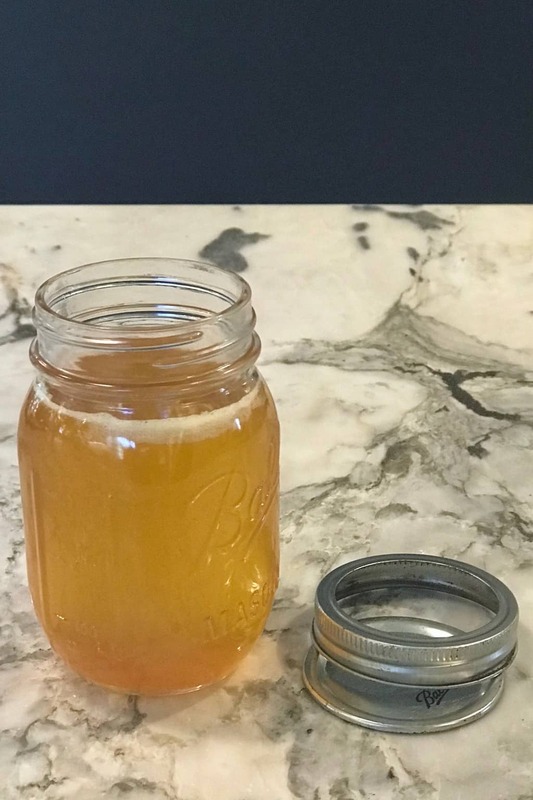 I have always been hesitant to make my own ghee but I decided to try it out since it sounded so easy in the instant pot. I turned it on normal sauté mode and put the butter in and put a timer for 9 minutes. Came out perfect! Thank you so much! Thank you for the lovely feedback. Comments like these make all the time I take to test and write my detailed recipes truly worth it!! Thank you!! It’s been cooking for 29 min and still foamy on top. Once it starts to overcook it will get very foamy. How much butter are you trying to cook?